A California couple has pleaded guilty to imprisoning, shackling and torturing some of their 13 children. David and Louise Turpin each admitted 14 felony counts including cruelty to an adult dependent, child cruelty, torture and false imprisonment. They were arrested in January 2018 when their 17-year-old daughter managed to escape the house in Perris. The children, ranging in age from two to 29 at the time, were found severely malnourished and abused. The 57-year-old husband remained impassive in Riverside Superior Court on Friday, but his 50-year-old wife wept as she pleaded guilty. District Attorney Mike Hestrin said during the brief hearing that the plea deal spared the children a trial that would have further traumatised them. He said the decision was made in part because of the "worldwide media attention" the case has received. "We decided that the victims have endured enough torture and abuse," he said. "I personally met with the victims and, rest assured, they all are greatly relieved to know this case has been resolved." Officers who raided the family home 70 miles (112km) south of Los Angeles found a scene of squalor and stench of human waste that contrasted with the tidy exterior of the property in a middle-class neighbourhood. Some of the adult victims' growth had been so stunted by malnourishment that authorities at first mistook them for children. Prosecutors said the parents beat, strangled and starved all of the children except for their toddler daughter. Some of them were chained to furniture in a campaign of abuse dating back to at least 2010. The victims were forbidden to shower more than once a year and none of them had ever seen a dentist. The children - whose names all begin with the letter J - were kept indoors, but were allowed out for Halloween, or on family trips to Disneyland and Las Vegas. 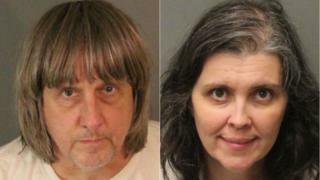 The Turpins face life in prison with the possibility of parole after 25 years. They will be sentenced on 19 April.